The PSNI said they believe Tara was injured in a road traffic collision on the Ballygowan Road, and have appealed for information. 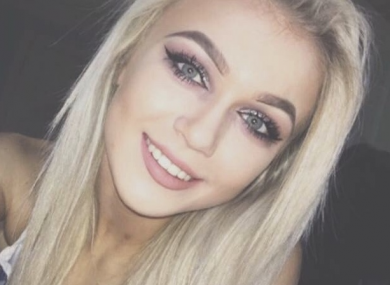 THE TEENAGE GIRL whose body was found near Belfast City Hospital in the early hours of Sunday morning has been named as 17-year-old Tara Wright. Police investigating the circumstances surrounding the teenager’s death, and the road traffic collision which occurred on the Ballygowan Road at its junction with Manse Road have appealed for information. Four men who were arrested yesterday have since been released and are helping the PSNI with their investigation. “Firstly, I would like to extend my sympathies to the family of Tara at this very sad time,” Inspector Nigel Henry said. Our investigation is at an early stage, however, we do believe that Tara was injured during the one vehicle road traffic collision on the Ballygowan Road. Investigating officers arrested four males aged 20, 21, 28 and 30 yesterday. They have since been released on bail and are assisting us with establishing the circumstances leading to Tara’s death. The PSNI is also urging those with dash-cam footage of either vehicle taken in the early hours of Sunday morning to contact them. Email “Teenager found dead near Belfast City Hospital named as Tara Wright”. Feedback on “Teenager found dead near Belfast City Hospital named as Tara Wright”.